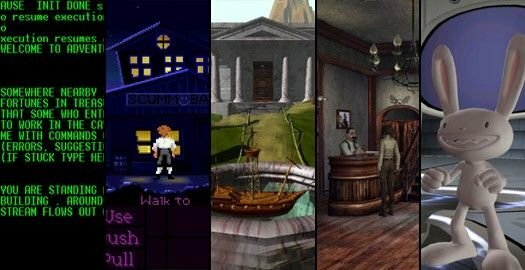 For over 40 years, adventure games have been the most story-driven computer game genre. Since its inception in 1976 with ADVENT (aka Colossal Cave Adventure, or simply Adventure), many have found adventure games to have a true immersive quality that can be compared to reading a book or watching a movie. If you are interested in playing games that can be thoughtful, engaging and intelligent, and provide some mental challenge while they’re at it, you’ve just landed on the right website. Adventure games are all about unraveling stories, exploring worlds and solving puzzles. Play as Ray McCoy on assignment to track down replicants in Blade Runner, embark on a four-year journey through the mystical Land Of The Dead in the Mexican folk art and film noir-inspired Grim Fandango, or travel the globe confronting ancient conspiracies in Broken Sword. When you’re playing an adventure game, you never quite know what you’re going to get. Fantasies, comedies, westerns, mysteries, horror, or sci-fi; there’s an adventure game for everyone. In fact, there are so many adventure games that it can be hard to find a place to start. Fortunately, this article should help you along your way. Adventure games focus on puzzle solving within a narrative framework, generally with few or no action elements. Other popular names for this genre are “graphic adventure” or “point-and-click adventure”, but these represent only part of a much broader, diverse range of games. Adventure games are not based on what the dictionary defines as “adventure”. Some are, but many forsake danger and excitement for more relaxed, thoughtful endeavours. They are also not: role-playing games that involve extensive combat, team-building and points management; action/adventures such as Uncharted and Prince of Persia where puzzle-solving is clearly a secondary focus; side-scrolling platform games such as Mario or LittleBigPlanet; pure puzzle games like Bejeweled or Tetris. But labels can only take us so far. Many games push traditional genre boundaries in new and interesting ways while still remaining adventure games at their core. Dreamfall, sequel to the point-and-click classic The Longest Journey, includes some stealth and fight scenes. Heavy Rain is a new breed of interactive movie-style adventuring featuring motion controls and Quick Time Events. At the other end of the spectrum, titles like Mystery Case Files: Dire Grove mix in plenty of Where’s Waldo?-styled scavenger hunts. Even Portal, which gives you a gun to solve physics-based puzzles instead of killing, has a right to be called an adventure. Of course, stories, puzzles, and exploration are not limited to just adventures. More and more games outside the genre are incorporating adventure game elements, like Scribblenauts, Braid and Limbo. Given their shared features, we will sometimes cover these as special “games of interest”, though always with the understanding that they fall outside the scope of our adventure game definition. There are three characteristics that are always present in an adventure game to some degree. Certain sub-genres focus more on one aspect than another. In adventure games, the story is often essential. Plots range in scope, tone and setting as much as movies and novels do. For instance, in Gabriel Knight you are attempting to solve a voodoo murder mystery in New Orleans, whereas Day of the Tentacle tells the comedy tale of three odd friends who travel through time in a portable toilet in a quest to defeat the toxically-tainted Purple Tentacle. Ideas are limited only by imagination, and adventure games are known for their original stories. In some adventures, however, the story is more a blank canvas to fill in through open-ended discovery than a series of predetermined events unfolding around you. In The Last Express, you’ll eavesdrop on conversations, scour compartments, and engage your fellow passengers in conversation on rails between Paris and Constantinople. As a defense lawyer in Phoenix Wright: Ace Attorney, you’ll spend much of your time in the same courtroom, pressing witnesses for answers and questioning suspect testimony. In games like these, what you do is far less relevant than what you learn through exploration, dialogue, and careful observation. Inventory puzzles: accumulating an inventory of items that are then used to solve puzzles. Some are as simple as using one item on another in the environment, but others are far more complex. Return to Mysterious Island allows for five or six items to be combined into a new object altogether before being used. Dialogue-based puzzles: interacting with secondary characters to accumulate clues and directions, or persuade them to help your cause. The Secret of Monkey Island’s famous insult swordfighting requires learning all the best quips to beat the most quick-witted, sharp-tongued opponents. Environmental puzzles: analyzing and altering your surroundings in the game directly, whether setting clock times in Machinarium or overflowing Flood Control Dam #3 in Zork Grand Inquisitor. Non-contextual logic puzzles: standalone challenges can include anything from sliders to chess to jigsaws. This type of obstacle usually has little or no relevance to the game’s narrative, serving mainly as a cerebral interlude in puzzle-adventures like Professor Layton or casual titles like Drawn: The Painted Tower. While a lot of adventure games contain basic inventory and logic puzzles, some games provide more exotic types of challenges. For instance, Bad Mojo is played as a scientist trapped in the body of a tiny cockroach, while in Stacking you acquire new abilities by leaping into new and larger stacking dolls to absorb their identity. Loom uses music as the basis for its puzzles. Regardless of type, the best adventures use puzzles creatively to advance the story rather than simply posing as arbitrary obstacles in the way. Adventure games usually require exploration to some degree, depending on the type of interface. In early text parser adventures, you had to navigate by typing in directions, such as “GO NORTH”. Modern adventures provide more intuitive ways to get around, often asking the player to move the cursor over the screen to find ‘hotspots’ (objects that can be looked at or manipulated). Others allow for more direct interactions still, highlighting objects of interest simply by moving your characters close to them. A few escape-the-room adventures like Samorost 2 are more streamlined than most, requiring you to complete all actions on one screen before moving to the next, though you must still carefully explore your immediate surroundings. A must read for all people who want to know more about adventure games. This summary of adventure games definitely piqued my interest in them again. The first game I got into was Myst, which totally absorbed me. Then, RPG and FPS games usurped more of my attention do to the character leveling and action. Now, I instruct kids in video game design through iD Tech Summer camps and so most of my focus (and the kids’) has been on FPS games. Some RPG since that is so popular. But I’m definitely going to use this website as a resource for encouraging more adventure, thinking, solving games. See you on the forums! It may seem opposed to the (current) traditional perception of adventures, but really it fits our definition beautifully. EDIT: Guess the preceding comment was deleted.